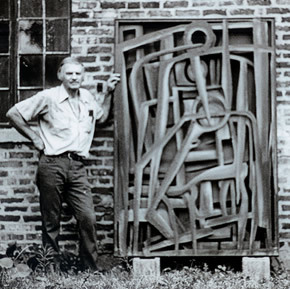 Best known as an iconoclastic painter and visual artist, Tristan Meinecke is also a writer, musician and architect who has been part of Chicago's art scene since moving here from Ann Arbor in 1943. Born in 1916, already a prodigious [artist] at age 3, Meinecke grew up to become a very well respected painter in the '40s and '50s, personally chosen by Art Institute directors Daniel Catton Rich (for the International Watercolor Exhibition, while he was still a student at Michigan) and Frederick Sweet (for the 62nd American Exhibition at the Art Institute of Chicago, 1957). His development of the "split level" approach to painting was an important and highly personal innovation in the mid-50s. On the musical side, he was a jazz clarinetist (played with many major figures on the south side in the '40s) and he studied composition with the avant-garde composer and pedagogue John Becker. In the '60s, Meinecke founded an architectural firm, Meinecke Studio, with important modern architect Robert Bruce Tague, and together they built numerous houses and apartments in the Chicagoland area. This exhibition, curated by Hal Rammel and John Corbett, opened in Chicago last year at 1926 Exhibition Studies Space. It conitunes in Milwaukee in 2004 with a slightly different selection of works at Woodland Pattern Book Center. © Meinecke ArtSpace 2008 - 2016 -- All pages and their contents are under various copyrights. All rights reserved.